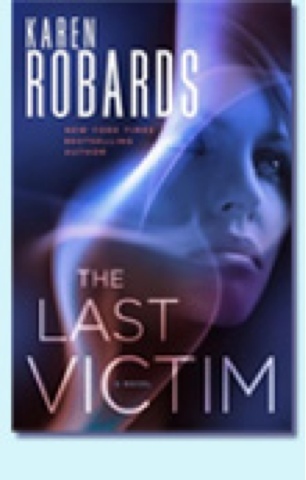 The Last Victim by Karen Robards is the first book in her new Dr. Charlotte Stone series. Although Robards is an established author in the romantic suspense genre, this is the first book of hers that I have read. As such, I am not sure that it was the best book for me to start with. For one, I like romantic suspense that is a bit more geared to the suspense than the romance. In the end, there were things about this book that I really liked, and some that bothered me. Dr. Charlotte Stone is a survivor. In fact, 15 years ago she was the lone survivor of a terrible serial killer. Unfortunately, she was the only living person who could identify him. This fact has haunted her for years and helped her to decide to become a psychologist who specializes in studying serial killers. As an expert, she is asked to consult with the FBI as a consultant on the case of a serial killer who seems eerily similar to the one that she survived all those years ago. This premise of this book was intriguing. I think the psychologist as a profiler is a tried and true device in a number of thrillers, and it always seems to work for me. I like the way it gives the author a way to look inside the mind and motives of the killer, and actually spell out what the killer is thinking without sounding like they are lecturing the reader. In this respect, Dr. Stone is a perfect example. Another device that works well is the romantic feelings and the tension that it causes between Dr. Stone and Bartoli, the head of the FBI team that she is working with. The plot line of the story was another part of this book that I enjoyed. Unfortunately, I sometimes felt that the thriller plot line was playing second fiddle to the romantic plot lines. Yes, I said lines. There were two of them. This brings me to the parts of the book that I was not that fond of. The biggest thing here, which I mentioned above, is that I felt that the main romance story line overshadowed the thriller storyline at times. I'm sure this is fine with many readers, but I am not a huge romance reader. I do think romance has a place in many story lines, and I am not averse to it altoghether, but I try to avoid books that may be considered "bodice rippers" (not my phrase, that is what some of my friends who read them call them). I would have preferred it if the thriller story line was a bit more front and center. The biggest thing that bothered me, though was the fact that the main character, who has had an emotionally scarring encounter with a serial killer in her teens, and is supposed to be a clinical psychologist on top of it, falls in love with the ghost of a serial killer. Although I liked the character of the ghost, and liked the way that he participated in the solving of the crime, the fact that he was the major love interest was not at all believable to me. Additionally, the fact that the author seemed to want to make him into a sympathetic character I found just plain disturbing. In all, this aspect of the story did not work for me. For a long time, I deliberated how many stars to give this book, but in the end, the things that I liked won out over the things that I didn't. That and the fact that I feel that I liked it enough to try the next one in the series.